Michael Brown will forever remain the poster child for federal incompetence. And the central question has yet to be answered: who was Michael Brown, and how did he end up at the helm of the Federal Emergency Management Agency? Indeed, how did he and his predecessor and mentor, Bush political operative Joe Allbaugh, manage to turn FEMA, a once proud and effective agency, into a national laughingstock? Days after Louisiana’s governor declared a state of emergency and the National Hurricane Center warned the White House that Hurricane Katrina could top the New Orleans levee system, the only FEMA official actually in New Orleans itself–Marty J. Bahamonde–was not even supposed to be there. He had been sent in advance of the storm and had been ordered to leave as it bore down, but could not because of the clogged roads. Michael Brown, the head of FEMA, was known to have made it to Baton Rouge but seemed out of reach. A week later, Brown would be replaced as on-site manager of the disaster. Blamed for his role in one of the largest domestic debacles in American history, Brown was still thinking of his own comfort: “I’m going to go home and walk my dog and hug my wife, and maybe get a good Mexican meal and a stiff margarita and a full night’s sleep,” he told AP. In the midst of America’s worst natural (and manmade) disaster, it became clear that Brown was indeed lost in Margaritaville. What has grown all too apparent in the months since Katrina is that much of the Bush-appointed federal leadership is every bit as inept and unqualified as Brown. Each new crisis seems to expose still more cronyism and patronage at the very top of the country’s leading agencies. The Medicare administrator Thomas Scully came from a job with the hospital association, stayed just long enough to pass the controversial and messy if business-friendly Medicare drug benefit, then left to become a drug industry lobbyist. Other stories are emerging at departments ranging from the Small Business Administration to the Mine Safety and Health Administration. And the head of the White House Office of Federal Procurement Policy had no prior experience in government contracting; he has since been arrested in connection with the sprawling corruption investigation surrounding lobbyist Jack Abramoff. From Harriet Miers (a Supreme Court nominee with no judicial experience) to Julie Myers (a virtual government neophyte named to head the Immigration and Customs Enforcement agency), Bush has set aside principles of sound governance to reward loyal operatives and shore up personal and party alliances. Sometimes, his tactics are transparent. Miers was a longtime legal adviser and trouble-shooter to Bush; and Myers, the niece of the former chairman of the Joint Chiefs of Staff, had at the time of her nomination recently married the chief of staff of her boss-to-be, Homeland Security secretary Michael Chertoff. We still do not know the true extent to which the government has been filled with Michael Browns. This is in part because of the media. At one time, major news organizations had a reporter assigned to each large federal bureaucracy, making it harder to sail these appointments through and then hide the incompetence and malfeasance. Now only a disaster can shine the spotlight. But Michael Brown will forever remain the poster child for federal incompetence. And the central question has yet to be answered: who was Michael Brown, and how did he end up at the helm of the Federal Emergency Management Agency? Indeed, how did he and his predecessor and mentor, Bush political operative Joe Allbaugh, manage to turn FEMA, a once proud and effective agency, into a national laughingstock? On any level, it makes absolutely no sense that Michael Brown should have been holding any major government post. Prior to joining FEMA, his professional pinnacle had been to serve as an inspector of Arabian Horse judges; his highest governmental job had been an assistant to a city manager in a small Oklahoma city decades ago. “Brownie” had done no known political work for George W. Bush. He was not an industry figure. He was not even among the many longtime allies of the Bush family. The only answer the public has ever gotten in the aftermath of Katrina as to why Michael Brown headed the Federal Emergency Management Agency was a peculiar and highly dissatisfying one: Joe Allbaugh wanted him there. Allbaugh is the brash and powerful but little-known Bush confidant who preceded Brown as FEMA director. When Allbaugh came to Washington, he brought Brown with him and rapidly promoted him until Brown was positioned to take over the agency. But why Michael Brown? Why, out of all the people Allbaugh had met over three decades as a GOP operative, did he place such confidence in a failed lawyer whose last job was a troubled tenure with an obscure association of show horse owners? When pressed, the taciturn Allbaugh tersely replied that Brown was a lifelong friend in whom he had confidence. To this moment, that has remained the official, indeed only, explanation of how and why Michael Brown was running FEMA when Hurricane Katrina struck. But a Real News Project investigation, encompassing scores of interviews and hundreds of documents, has uncovered another reality. It begins with this astonishing fact: nearly all of Joe Allbaugh’s friends and acquaintances say they had never heard of Michael Brown, never met him, never even seen the two men in each other’s presence. To them, Michael Brown is a complete stranger. Allbaugh’s explanation of why he chose Brown as his heir apparent at FEMA baffles one and all. The truth, RealNews has learned, is that the relationship between the two is a decades-long hidden partnership designed to advance both men’s business and personal interests. By all appearances, that relationship encompassed Allbaugh’s decision to ask Bush to let him run FEMA, and then his decision to turn the place over to Brown so he could profit from their ties. Indeed, as soon as Allbaugh left the agency, he began cashing in. Today, both Allbaugh and Brown are consultants, making money off their connections at FEMA and in the administration-tattered and tarnished though their legacies may be. And now FEMA is staffed by others put into position by the two men and run by David Paulison, best known for having advised Americans to stock up on duct tape as protection against future terrorist attacks. Is this really just about incompetence as a byproduct of a deeply ideological presidency? Or has a debilitating “culture of corruption” become deeply embedded in agencies like FEMA on which we literally rely for our lives? And just how far into the Bush White House does this dismaying story reach? In a more perfect world, the media, the Congress and engaged citizens would have wanted to know a bit more-indeed a lot more-about Joe Allbaugh and Michael Brown before confirming them in important managerial positions. Even a hard look at Brown’s last job before FEMA would have set off the appropriate alarms. Brown’s decade as Commissioner of Judges and Stewards of the International Arabian Horse Association (IAHA) represents the longest employment he ever had, and, arguably his most prestigious and greatest accomplishment. That Brown nevertheless knew it was a singularly inappropriate qualification for the leadership of FEMA is evident from FEMA’s official Brown biography, posted on its website, which did not mention this job at all. Brown, it turns out, had good reason to be modest about this portion of his career. When the new post into which Michael Brown stepped at IAHA was created, the organization’s members were told that their leadership had sought out a person with several key characteristics: competency, experience, and total independence from the cronyism of the horse world. In fact, what IAHA members got was the virtual opposite. In retrospect, it looks to some like the fix was in. Brown’s job was to address concerns about the integrity of the horse judging process. But the main thing-almost the only notable thing-Brown did in his years with the IAHA was to pursue a politically-motivated investigation of the sport’s most successful trainer, a man who had angered powerful people with connections at the top of the Republican Party. The trainer, David Boggs, was accused of cosmetically altering the appearance of a show horse, a serious violation of competition rules. Brown ordered Boggs banned from the show circuit for five years, a Draconian punishment tantamount to putting the trainer out of business. Boggs’s competitors were delighted. David Boggs (who did not respond to interview requests) was, by most accounts, a talented and dedicated trainer whose successes on the circuit were well deserved. But according to Hart and others, he was envied and even hated by several extremely rich Arabian Horse owners-owners who happened to also be very large Republican donors, including the late Bob Magness, a founder of the TCI cable giant; David Murdock, the Dole food company billionaire; and the late Alec Courtelis, a Florida developer. To this day, Hart (along with other longtime IAHA elders) says he’s not sure whether or not Boggs was guilty. (IAHA’s top administrators declined requests for interviews about Brown.) Since the horse in question is today the preeminent sire of the breed, Hart thinks genetics may have been more of a factor in its near-perfect profile than the putative illegal cosmetic surgery. In any case, Boggs filed a battery of lawsuits against both the association and Brown, the financial toll of which contributed to the association’s near-bankruptcy and eventual merger with another group. There is no evidence that the big donors knew in advance about plans to hire Brown; Courtelis and Magness are deceased, and Murdock did not respond to an interview request. Yet, Brown’s performance clearly pleased influential sectors of the IAHA, as is apparent from the special treatment he was accorded. While other staffers had to report to work each day, Brown, on a full salary, was allowed to work from his sprawling, mountain-air home in Lyons-more than an hour’s drive north of IAHA’s headquarters in Denver. His lifestyle was so pleasant and relaxed that some in Lyons assumed him to be semi-retired. James Van Dyke, chef-owner at Lyons’ Gateway Café, says Brown had leisurely lunches at the restaurant almost daily. “He seemed to have a lot of time on his hands,” says Van Dyke. Brown’s single-minded pursuit of Boggs contrasted sharply with a pronounced reluctance to pursue another case that seemed to have considerable merit-one involving Murdock’s trainer, who was accused of filing false papers for a show horse. Ironically, it would be Murdock himself, in his zeal to help Brown’s cause, who would eventually sink him. One day, he mentioned to Hart that, at Michael Brown’s request, he’d written him a $50,000 personal check, ostensibly for a legal-defense fund to deal with Boggs’s suits. Hart was staggered to hear this, since the association was already paying Brown’s legal bills. There wasn’t, and Brown was terminated immediately. Why exactly would this apparent incompetent be tapped for one of the most sensitive jobs in post-9/11 Washington? The key to that mystery lies in the career of Joseph Allbaugh, George W. Bush’s adjutant since 1994, who first met Brown back in the 1980s when both were young men starting out professionally in Oklahoma. Contrary to early, widely-disseminated news accounts, Allbaugh, 53, and Brown, 51, were not college roommates – nor did they even attend the same university. The two men’s public lives and career paths up until FEMA look like parallel lines on a chart – distinct and unconnected. Yet there was a connection, one that only showed up through extensive records searches. The first verifiable direct link between Allbaugh and Michael Brown is in an obscure company called Campground Development Corporation, which Brown and his brother-in-law, Bill Oxley, formed in 1985. For two years, records show, Campground Development employed Joe Allbaugh as a state capitol lobbyist. Prior to that, Allbaugh himself had started an oil-and-gas partnership called Great American Resources, and brought in Bill Oxley’s wife as a partner. The secretary and treasurer of that firm was Allbaugh’s then-wife, Gypsy Hogan, who says she had no idea what the business was about and wasn’t comfortable with large amounts of unexplained cash flowing in – or Allbaugh’s request that she sign a series of blank checks. When she began to demand answers, she says, Allbaugh angrily warned her to mind her own business. Hogan also remembers that, shortly before she asked him for a divorce, Allbaugh claimed to be in the C.I.A. As Allbaugh was pursuing his private ventures, he was also moving up in the G.O.P. firmament. He’d started in college as a driver for U.S. Senator Henry Bellmon (Republican of Oklahoma and longtime friend of George H.W. Bush), then became Bellmon’s field representative before becoming an operative for the national Republican Party. In 1976, he held a top post in the statewide Ford for President campaign. By 1980, Allbaugh was traveling widely, working on campaigns throughout the country; in 1984 he rose to be deputy regional coordinator for the Reagan-Bush reelection campaign, responsible for 11 Western States. That year, by his own account, he met George W. Bush, who was in Oklahoma City on behalf of his father’s campaign. But not just to the GOP. Records obtained by The Real News Project show that in 1984, while running the regional Reagan-Bush reelection campaign, Allbaugh personally borrowed $24,000 from McPhaill. He never repaid the bulk of the debt. When McPhaill died in 1996 at age 92, her $3 million inheritance had shrunk to a net worth of $50,000 – with much of her fortune, according to Gates, being enticed into GOP causes and dubious investments like Allbaugh’s. That Allbaugh would not want his insolvency made public is unsurprising. As George W. Bush’s campaign manager, he would preside over a record-breaking fundraising spree engorged on promises to credit issuers that new laws would make it more difficult for ordinary citizens to declare bankruptcy. He also might have faced scrutiny over some of his business associates: Grant Forth, another limited partner in Great American Resources, would later be convicted in a Nevada federal court of mail and wire fraud and serve time in federal prison. From there, the stakes got higher. In 1988, Allbaugh left government to take a job with Stephens Inc., an investment-banking firm run by an old Bellmon friend. When Allbaugh arrived, Jack Stephens was busy currying favor with Vice President George H.W. Bush, then likely to be elected president. He gave $100,000, the legal maximum, to Bush’s campaign and helped bail out the vice-president’s son, George W. Bush: it was Stephens who helped arrange for a Saudi oil magnate to buy an ownership stake in Harken Energy, W.’s oil company, which was struggling to stay afloat. Allbaugh’s arm’s-length friend Brown, meanwhile, was racking up his own record of dubious public service throughout the late 1970s and 1980s. In his much remarked-upon first job, as assistant to the city manager of Edmond, Oklahoma, he was closely allied with the town’s mayor, Carl Reherman, who had been Brown’s political-science professor in college. His immediate boss from those days, city manager Bill Dashner, characterized Brown as a “mole” for Reherman, providing him with information regarding controversial development projects over which the two quarreled. In an interview, Reherman denied that, and noted that the council voted unanimously on most matters. Perhaps the biggest bone of contention over the years was a public-works project that became so expensive the city defaulted on its payments to the Army Corps of Engineers-the same highly politicized outfit with which FEMA is joined at the hip. Brown did not mention this experience during his confirmation hearings. Whether he began as gopher or go-getter, Brown moved quickly after his arrival in Edmond into a series of posts of increasing influence, including election to a short stint on the city council and a job with the state legislature, where he helped draft legislation creating the Oklahoma Municipal Power Authority (OMPA), a little-known public-power entity that he would later chair. The attraction of this unpaid position was explained by Brown, who noted to others that it allowed him to interact with major bond-underwriting firms, all clamoring for the group’s lucrative business. When Brown was forced to relinquish his seat on the utility board because he had moved from Edmond, he found his way back by persuading the town of Goltry, Oklahoma, population 800 and one stop light, to join the energy consortium and make him its representative. In a questionnaire he supplied to the Senate during his confirmation process, Brown wrote: “Michael D. Brown Hydroelectric Generation and Dam Project Named in my honor by the Oklahoma Municipal Power Authority Kay County, Oklahoma, 1988.” That minor tribute (dubbed by one wag “Dam Michael Brown”) would amount to his sole pre-Katrina familiarity with the subject of flood control. But according to the longtime OMPA general manager, Roland H. Dawson, the facility itself is actually called Kaw Dam, while the only tribute to Brown is a plaque from the board he chaired. After passing the Oklahoma bar in 1982, Brown moved to the oil boomtown of Enid, where he was hired by the law firm of Stephen Jones, a flamboyant attorney who went on to defend Oklahoma City bomber Timothy McVeigh. There, according to his other sister-in-law, Brown bobbled a wrongful-death suit for a woman whose husband’s car was hit by a train when crossing signals failed to work. When the firm busted up, literally, after a fistfight that left Jones sporting a shiner on the front page of the local paper, the partners divvied up the staff. Thirty-four staffers found immediate work. Brown was one of two staffers no one wanted. “When I saw Brown up there at FEMA, I had a premonition of bad things to come,” recalls Jones. In the ensuing years, Brown would be sued for skipping out of shared law offices without paying his share of the rent-a piece of civil litigation he (like Allbaugh) neglected to include on forms submitted as part of his Senate confirmation proceedings to become deputy director of FEMA. This despite the obligation that federal nominees disclose such litigation. He would also be believed by his sister-in-law to have aided her brother, Bill Oxley, in changing their father’s will in a way that left the Browns and Oxleys living well while she and her husband were reduced to virtual paupers. During those years, if Brown’s resume is to be believed, he was also doing legal work on behalf of the Oklahoma Republican Party. All of this was, of course, mere cold French fries compared to what would come. For Michael Brown, the good times would not begin to roll until early 2001, with a call from Joe Allbaugh. For Allbaugh himself, the good times began in early 1994, with a call from George W. Bush. The official story is that Bush’s gubernatorial campaign lacked a strong hand at the tiller, and that Henry Bellmon’s people recommended Joe Allbaugh as just the man to steer the campaign to victory. “He said he’d been involved in campaigns in 37 states by the time he got to Bush,” says Dave McNeeley, a former political columnist for the Austin American-Statesman. In newspaper articles, Allbaugh explained his role in the Bush gubernatorial campaign as making sure the trains ran on time, and mediating the strong personalities of Karl Rove and Karen Hughes. To Bush’s Brain and Bush’s Mouth was added Bush’s Muscle. At 6-foot-3 and 275 pounds, Allbaugh was an intimidating presence. Some would later liken him to the blockish Sergeant Schultz on the classic TV show Hogan’s Heroes, who used to utter, “I see nuuussing,” while surrounded by mischief. “It was clear he wanted to use his size to project a strong or menacing sense of himself,” says Wayne Slater, Austin bureau chief for the Dallas Morning News. 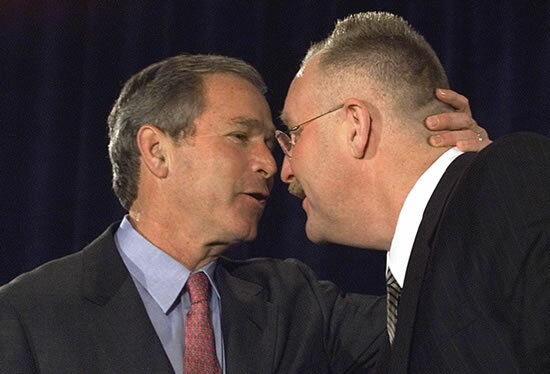 Indeed, Allbaugh’s propensity to turn bright red when enraged led Bush to give Allbaugh the nickname “Pinky.” But if anyone other than W. dared to call him by that name, Allbaugh would whirl around and growl, “I will pinch your head off,” and make pinching motions with his fingers. Ironically, the other heavy was a small, refined woman by the name of Harriet Miers, hired, as was Allbaugh, by the tough Dallas lawyer Jim Francis, then Bush’s campaign chairman and a longtime friend of Bush’s father. As general counsel, Miers was in charge of fending off legal problems that threatened Bush with adverse publicity. In 1999, Allbaugh left the governor’s office to take over the daily management of Bush’s presidential campaign. He headed up a staff of 180, controlled spending, and spoke with Bush several times a day. One potential problem facing the campaign was the rumor that Bush’s father had pulled strings to get his candidate son out of Vietnam service and into a safe Texas Air National Guard unit in 1968. There were even reports that Bush went AWOL long before his compulsory flying days were up. The key players in keeping the lid on the National Guard story were Allbaugh and Miers. In 2004, a year before Bush nominated Miers for the Supreme Court, Allbaugh told The New York Times, “She’s the kind of person you want in your corner when all the chips are being played.” Assigned to “investigate” Bush’s Guard service, Miers gave the governor a clean bill of health. As part of his job, Allbaugh communicated directly with Adjutant General Daniel James III, the head of the Texas National Guard (later appointed by President George W. Bush to run the federal Air National Guard). What remains unclear is whether he ordered James to dispose of any old Bush military files that might prove embarrassing, an order former Lieutenant Colonel Bill Burkett, head of a Guard efficiency task force, claims to have heard Allbaugh issue in a conversation on James’s speakerphone. Whatever was or was not done, the unexplained gaps in Bush’s National Guard service never became a central topic in the 2000 election. With his “iron triangle” of Rove on strategy, Hughes on P.R., and Allbaugh as the enforcer (plus an assist from the U.S. Supreme Court), Bush triumphed. Meanwhile, the unsinkable Michael Brown rebounded once again, this time from his firing at IAHA. Just as the politics-tinged Horse Association job in Colorado appeared when Brown faced career and financial problems in Enid, Oklahoma (and the Stephens job fell into Allbaugh’s lap when his financial difficulties mounted), Brown would be fortuitously safety-netted again, this time with a near-instantaneous hiring by an anti-union electrical contractors’ association that later won warm praise from President Bush. Another constant in Brown’s bumpy career has been timely assists from his self-described “longtime friend and family attorney,” Andrew Lester. A prep-school contemporary of George W.’s brother Marvin, Lester pops up at crucial points in Brown’s life like a fairy godmother. When Brown lost an early legal job, Lester brought him in for a brief stint as his law partner. When horse-association problems engulfed Brown, Lester rushed to his defense. And on September 27, 2005, at a House select committee hearing investigating the Katrina blunders, there was the pin-striped Lester conspicuously whispering legal advice in Brown’s ear. Lester, who represented the Oklahoma Republican Party in a 2002 reapportionment battle, worked for a Bush-family-connected oil services firm when he was younger, has been a close friend of Justice Clarence Thomas and regional director for the secretive Federalist Society (new Chief Justice John Roberts denied being a member until his name turned up on a list); he was also short-listed for a federal judgeship under George W. Bush. To this day, Lester insists his support is merely a factor of friendship, and maintains that Brown was eminently qualified for FEMA. As Bush’s Texas team headed for Washington, it was clear that Joe Allbaugh had neither the experience nor the sophistication to serve as the White House chief of staff, the position he coveted. That job went to Andy Card, who had served in the senior Bush’s administration. CNN quoted a “source close to the transition team” who predicted that Allbaugh would become one of two deputy chiefs of staff. Instead, he landed at FEMA. If it was a fiefdom he was after, FEMA would do nicely. Allbaugh had enjoyed being the governor’s interface with emergency agencies during minor crises in Texas. At FEMA, he would have more than 8,000 employees and a $4 billion budget to play with. The selection was made, and Allbaugh, having failed to reveal his bankruptcy, his lawsuits, and the general messiness of his life up to that point, was confirmed by the Senate with minimal scrutiny. From its inception under Jimmy Carter, FEMA had traditionally been patronage territory. George H.W. Bush appointed Wallace Stickney, a former next door neighbor of Bush Chief of Staff John Sununu, who had headed New Hampshire’s Department of Transportation and been an EPA engineer. 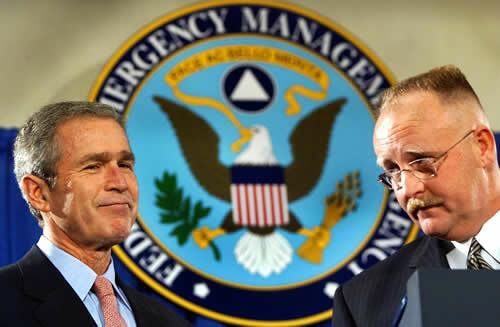 Stickney presided over FEMA’s inept handling of Hurricanes Hugo and Andrew during the first and last years of the elder Bush’s term, events that many political observers believe contributed to Bush’s loss to Bill Clinton in 1992. Clinton introduced reforms at FEMA and appointed his former head of disaster management in Arkansas, James Lee Witt, as director (which was elevated to a cabinet-level position.) Witt communicated confidence in his agency, its role, and its personnel, and FEMA morale soared. Republican Senator Ted Stevens sought to keep Witt on indefinitely, drafting legislation to make the FEMA directorship a longer-term, fixed position. Even George W. Bush praised Witt, leading many to hope that Bush might keep him on. But the candy store was simply too big to leave to a holdover from the hated Clinton administration. The front office was Allbaugh’s bunker. Abandoning a tradition of using civil-service professionals for certain vital posts, he quickly staffed up with loyalists. These included Deputy Director Patrick Rhode, Deputy Chief of Staff Scott Douglas, and Acting Deputy Chief of Staff Brooks Altshuler, all political operatives with no professional experience in emergency disaster management. One senior staffer who did get on an elevator with the hulking Allbaugh made the mistake of complimenting his boss on his fine performance on Meet the Press that weekend. “Why would you care?” Allbaugh snapped. Allbaugh soon embarked on a Nixonian purge. Acting upon his orders, a reluctant inspector general launched a series of internal investigations, looking at everything undertaken by the Witt administration, including Witt’s own travel expenses. Nothing of note was found, and on several occasions the I.G. proclaimed his job done, only to be told to keep looking. Allbaugh launched his longest investigation into a headdress that used to hang on James Lee Witt’s wall, a token of appreciation from a Native American tribe in recognition of his efforts following the Oklahoma City bombing. Someone said it might contain feathers from the protected bald eagle-a federal offense-but the probe, which even involved the F.B.I., fizzled when they turned out to be dyed chicken feathers. With little understanding of or experience with large-scale disasters and little patience with federal bureaucracies, Allbaugh was happy to go along with the administration’s view of FEMA as a bloated entitlement program in need of drastic cutbacks. “His position was that the states ought to take a bigger role,” says Reid. Flood mitigation, a high priority under Witt, received short shrift under Allbaugh. The chief of mitigation, Anthony Lowe, was replaced with a veteran of the insurance industry. Steve Kanstoroom, an independent fraud-detection and pattern-recognition expert with 22 years’ experience, found that FEMA was allowing insurance adjusters to use software that set artificially low settlement amounts for flood victims, and that the claims-assessment process was deeply compromised by involvement from insurance-industry figures. In retrospect, Allbaugh’s most damaging accomplishment at FEMA was pre-positioning Michael Brown as his successor. Allbaugh included him in all key deliberations, even naming him Chief Operating Officer, and Brown’s influence was apparent to all. Within six months of Brown’s arrival as general counsel of FEMA, Allbaugh was ready to promote him. First, though, he had to oust his current acting deputy director, John Magaw-a former director of the U.S. Secret Service and the Bureau of Alcohol, Tobacco and Firearms, whom Clinton had placed in charge of coordinating domestic-terrorism efforts for FEMA. “One day, Mr. Allbaugh came in and said, ‘I know you’ve got these other things to do. I’m going to ask Mr. Brown to be deputy,” recalls Magaw, who promptly returned to the domestic-terror position assigned him by Clinton. The timing was remarkable. Just a week prior to September 11, 2001, Allbaugh removed one of the most experienced men in government and replaced him with one of the least experienced. In December, with the country focused on terrorism and on preventing any more attacks, Magaw left FEMA altogether, at the White House’s request, to help start the Transportation Security Administration. But before Brown could take over permanently as deputy director, he had to face the Senate. In June 2002, he presented a résumé that was riddled with exaggerations about his experience and serious omissions about his financial and legal problems. One question on the disclosure form asks, “Do you know why you were chosen for this nomination by the President?” In a meandering written response, he wrote, in part: “I hope the President has nominated me for the position of Deputy Director based on my commitment to the agency and my ability to work closely with the Director.” Brown was confirmed in a cakewalk. Yet structural change at the agency was imminent. In the aftermath of 9/11, with the public clamoring for coordinated anti-terror responses, it was evident that FEMA could not remain independent. Bush, having initially opposed the creation of a Department of Homeland Security, eventually caved to Congressional demands, and Joe Allbaugh began to look for his exit strategy. 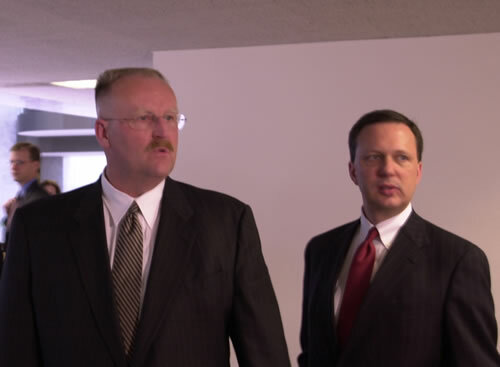 The moment Homeland Security swallowed FEMA, Allbaugh departed for the private sector, leaving Brown in charge. Initially, FEMA staffers greeted Allbaugh’s hand-picked successor with a sigh of relief. Brown was as outgoing as Allbaugh was introverted, as charming as Allbaugh was gruff. On first meeting, people came away feeling like they’d known him for a long time. “I was pretty impressed with him,” says Trey Reid. “He was articulate, bright, a quick study. I didn’t have to spend much time going over things with him.” On the personality front, Brown was a vast improvement. In terms of disaster-management, there were two eventualities FEMA lifers always worried about: a really big California earthquake, and levee breaks in New Orleans. But worrying and fixing were two different things. Brown, on the advice of aides, asked for more money for levees and catastrophic planning, but neither Congress nor the White House would bite. Despite all the cuts, however, there was always money for political purposes. Ever mindful of avoiding his father’s mistakes-among them the disastrous handling of Hurricane Andrew in 1992-Bush was not about to lose to John Kerry over disaster relief. Under Brown, the response to a series of hurricanes that battered Florida during the 2004 presidential campaign was as choreographed as Bush’s landing on the U.S.S. Abraham Lincoln the previous year. Agency staffers were everywhere, in FEMA T-shirts, and Brown was especially visible. An investigation by the South Florida Sun-Sentinel later found that FEMA had handed out tens of millions of dollars following Hurricane Frances to residents and businesses in the Miami-Dade county area, where no deaths and only mild damage occurred, while providing much less assistance to areas that were harder hit but less politically crucial. By August 2005, Brown was already rumored to be preparing his own exit into the private sector. And just as Allbaugh had a reliable understudy in Brown, Brown readied his own, elevating Patrick Rhode, a former Bush campaign advance man who had become his chief of staff, to deputy director. While Rhode lacked experience in emergency management, his public-relations and media skills had been sharpened as a former television news anchor and reporter. Perhaps they’d been sharpened a bit much: It was Rhode who, several days into the Katrina disaster, would call FEMA’s performance “one of the most efficient and effective responses in the country’s history. If being ostensibly “anti-government” while playing a leading role in government is tricky, it all pays off on the back end. Nobody knows that better than Allbaugh, whom Newsweek recently described as having “the hide of a rhino” when it comes to criticism of conflicts of interest. Once he left FEMA, he moved quickly to make up for years of privation in the public sector, forming the Allbaugh Company with his wife, Diane, an attorney. Diane Allbaugh had begun laying the groundwork from the moment they arrived in Washington, D.C., repeating a pattern she’d established in Texas. In the summer of 1996, just a year after moving to the Lone Star State, Diane had signed on as a lobbyist with a number of large corporate clients, mostly energy firms, with pressing business before the state, while her husband held a highly visible position as the governor’s top aide. When the newspapers reported the story, Governor Bush’s office hastened to announce new rules, and Diane declared an end to her lobbying career. However, she was soon ensconced in a ‘non-lobbying’ position with a law firm representing some of the same companies. Now, in Washington, she jumped into the K Street fray, becoming “of counsel” to Barbour, Griffith & Rogers, which Fortune magazine described at the time as the country’s most powerful lobbying firm. The shop’s founder, Haley Barbour, who would figure prominently in the Allbaughs’ improving financial prospects, was the very definition of a self-dealer. After founding the firm, he stayed involved with it while playing a key role in the privatization of government services as chairman of the Republican National Committee during Newt Gingrich’s “Contract with America” revolution, then served as chairman of Bush’s 2000 presidential campaign advisory committee. He left the company in 2003 to mount a successful run for governor of Mississippi-where he ended up on television talking about how his citizens were suffering from Katrina. No one thought to point out how the Allbaugh-Brown-Barbour model of disaster management had set the stage for the calamity. A cynic (or a realist) might formulate that model like this: Why spend resources to prevent disasters, when there’s so much money to be made cleaning up after them? Allbaugh’s web of self-interest ranges from disasters to energy to real estate. And the self-serving links involve not just him, his wife, Brown, and Barbour but also the vice president and the president. Haley Barbour advised the Bush-Cheney campaign on strategy in 2000 while Joe Allbaugh was campaign manager. During the transition, Allbaugh vetted Cheney’s qualifications to be vice president. After the election, Allbaugh served on Cheney’s secretive energy task force while his wife was “of counsel” at the Barbour firm and being paid as a “consultant” by Reliant Energy, Entergy, and Texas Utilities Co. Diane Allbaugh says she did no lobbying. But Barbour, on behalf of an electricity-producing client, successfully pushed Cheney’s task force to recommend that the new administration renege on a campaign promise to limit carbon-dioxide emissions from power plants. Bush, citing the task-force findings, complied. The Allbaughs and Cheneys are literally so at home with each other that, on first arriving in Washington in 2001, the Allbaughs bought Cheney’s townhouse in McLean, Virginia, for $690,000. During the house tour, Cheney must have pointed out the revolving doors. One of Allbaugh’s biggest clients is Cheney’s former employer, Halliburton, whose Kellogg, Brown and Root subsidiary got at least $61 million worth of Katrina business. When Allbaugh left FEMA he did not, however, restrict himself to the domestic disaster business. Instead, he cast a wider net into the entire Homeland Security/Defense sector, thereby stressing his implied connections in the Department of Homeland Security, which had absorbed FEMA, and in the Pentagon and White House. His departure from government, in March, 2003, took place precisely as the invasion of Iraq unfolded. Allbaugh formed, with Barbour Griffith and numerous ex-officials of the Reagan and Bush 41 administrations, a company called New Bridge Strategies. It moved to secure contracts in Iraq the moment hostilities commenced. He also formed Blackwell-Fairbanks, a joint venture with Andrew Lundquist, with whom he had served on vice president Cheney’s secretive energy task force. (The name of the company is based on the hometowns of the two principals.) Clients in 2004 included the aerospace giant Lockheed Martin; on required forms, Blackwell-Fairbanks would later report that it had lobbied both the offices of the president and of the vice president. Filings for Joe and Diane Allbaugh’s The Allbaugh Company show among its clients Oshkosh Truck, the leading supplier of vehicles to the Pentagon. Now-Governor Barbour, who in early September dismissed criticism of the federal Katrina response as “all cooked up by the news media and a few enemies of George Bush,” declined a RealNews interview request. We may expect revelations in coming months and years about the process through which FEMA awarded contracts. But it is likely that even the most cursory examination will uncover high-level decisions that carried little obvious public benefit. One such example might be the agency’s abrupt 2003 decision to award an exclusive contract for water supplies in emergencies. Prior to the Allbaugh-Brown reign, FEMA had handed out water contracts to a variety of companies. One of the recipients, not surprisingly, was Nestle Waters North America, easily the continent’s biggest producer, with 15 brands of bottled water and 23 bottling facilities in the U.S. and Canada. Then, without explanation, FEMA went sole-source, picking a little-known, family-run firm called Lipsey Mountain Water. The company, based in Norcross, Georgia, had just 15 full-time employees, no production capacity and no distribution network. Instead, it was aggressively soliciting other companies to supply its needs. Yet no one devalued the work of the rank and file of FEMA workers more than the Joe Allbaugh, Michael Brown, and their boss. And the discourse the administration wished to avoid was, and is, urgently needed. 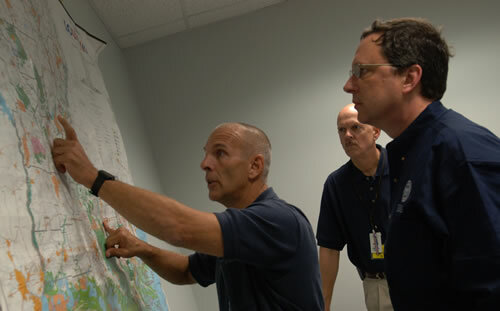 Today, FEMA’s front line troops struggle with the legacy of Katrina, overwhelming challenges and devastated morale. Meanwhile, Joe Allbaugh travels the world, soliciting business, and even the disgraced Brown has announced his move into the consulting business. 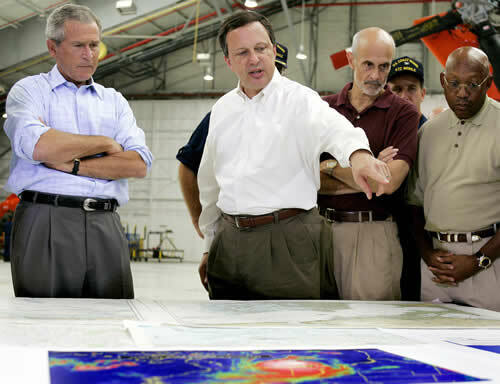 President Bush has thus far not had to explain anything – and the White House has declined to turn over to Congress key documents about Hurricane Katrina or to make senior officials available for sworn testimony.